From cult film to Broadway behemoth to dazzling movie musical, Hairspray is riding high and thus Hairspray Halloween costumes will be much in demand this October. 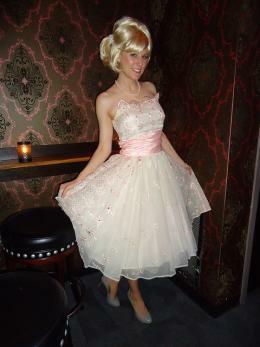 Luckily for all would-be rockabillies, this look is easy to buy or create for a fun group costume for adults or teens. It's also comfortable to wear and dance in, so you will be sure to rock the night away. Tracy/Edna Turnblad Pink Sequined Dress: A shimmery '60s confection lined in pink taffeta with satin trim on the cuffs and collar and separate belt. Available in Teen and Adult plus sizes, as befits the fabulous Tracy and her hot mama. Most fun of all, there's a version of this dress sold for men! Motormouth Maybelle Gold Gown: A hot number for a hot babe, this costume comprises a metallic gold net dress trimmed with red feathers at the sleeve and hem. The skirt is lined and there is a gold belt. It is meant to be worn with a red bra, which is not provided, but that's OK because you will definitely look better in your own bra. You can also buy the blond wig and gold shoes to finish the look to perfection. Available in Adult Plus. Penny Pingleton Green Dress: A bouncy green and black-check jumper with fun button accents. White blouse is attached and has eyelet trim on the front. A perfect Penny wig is available separately and dress comes in either Teen or Adult sizes. Tracy Turnblad Day Outfit: A white poplin blouse with lace-edged scarf neckline, lace-trimmed sleeves and button front tops a pleated black and yellow skirt with decorative stitching and an elastic waist. Available in Teen or Adult Plus. Link Larkin Suit: Want to make the girls swoon? No problem, if you're wearing this blue plaid jacket with black half-shirt, skinny white tie, black stovepipe trousers and faux leather belt. They've got a great Link Larkin wig sold separately and you can buy shoes from them too, should you wish. Available in Teen and Adult sizes. Accessories: In addition to the wigs available for Maybelle, Penny and Link, there are two wigs for Tracy, a plain and a frosted, and one for Edna. There's also a fantastic inflatable can of hairspray, which is totally worth the extra $10. If you want to tailor a Tracy look yourself, it's relatively easy to make Hairspray Halloween costumes, so long as you have sewing experience or access to excellent vintage shops. Sewing patterns from the early 1960s are readily available in many vintage shops, as are blouses, skirts and dresses in all shapes and sizes. The clothes skim the body, but are not so closely fitted as to require complicated tailoring, so you can whip up a simple straight skirt in the pattern of your choice in a matter of hours. Likewise, a boxy dress in a bright pink is easily put together. For the skirt and blouse outfit, a pair of Keds and bobby socks finishes your look nicely, whereas low pink or black pumps work for the dress. However, it wouldn't be a Hairspray Halloween costume without the hair! If you don't want to buy a wig, be prepared for some hard work. Getting the right poufy flip involves backcombing, hot rollers and, yes, hairspray. To look your best, you might consider going to your hairdresser. If you're going to do it yourself, allow a lot of time and practice beforehand. Spritz yourself up and shimmy on down!